Yesterday, I was cleaning out my closet. Not my favorite job, but it needed to happen. While going through old stuff, I found my pregnancy journal. It’s a journal that goes day by day and tells you what is happening with your baby that day. You write in the dates according to each pregnancy. I had diligently written dates, special happenings and memories for both Sam and Jordan’s pregnancies. I had also written dates for my two miscarriages. What was oddly missing was Elijah’s pregnancy and birth. Elijah, our fourth child, but only my third biological child, was born three years ago, after two miscarriages and then an adoption. 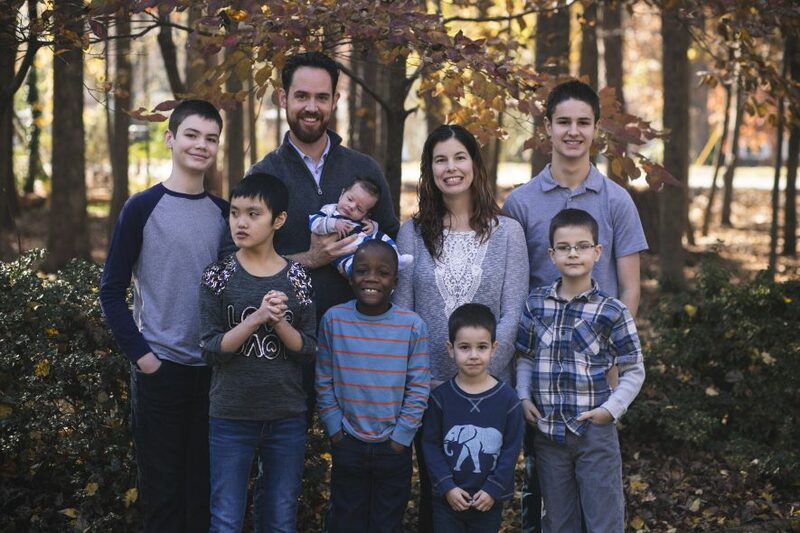 We found out we were expecting him after being home with our newly adopted son Joshua, for only a month. We were surprised and nervous, because of the losses we had experienced just before adopting Joshua. In fact, when we turned to adoption I had said I could never get pregnant again because I couldn’t bear another loss. But there we were just one year after our second miscarriage unexpectedly expecting. I cried when I found out I was pregnant. Not because I was overwhelmed by raising two kids so close in age, that would come later, but because I couldn’t bear to the idea that I might experience another miscarriage. We made it through Elijah’s pregnancy, although not without some drama, as we discovered in the third trimester he had his cord around his neck. I went every week to the doctor to do non-stress test to make sure as he grew he was okay. He was born on his due date and when he came out they discovered he had the cord around his neck not once but three times. That is very rare. We realized God had his hand on this child. We knew that before, but experiencing tragic loss and near loss really helps you KNOW that God is in control and you are not. I still worried about Elijah even after he was born. I worried he would die from SIDS. I just couldn’t bear another loss. I knew I had to come to grips with that when it came time, at 3 months, to move him into the room with his brothers. I was terrified that if he was that far away from me that he would die. I finally realized, I had to let go. I had to come to terms with the fact that God alone controls the destiny of each of my children and He controls how long they will live. I can do nothing to change any of that. I gave Elijah and my other children over to God one night. I sat next to each one’s bed during the night and cried, prayed and told God He was in control and I was not. It was a big turning point for me. I had not realized until yesterday that I had never written a single word about Elijah’s pregnancy in my journal. I went back yesterday and tried to remember what I could and record it for him. It really hit me what a state I was in at that time. I was living in the past. I was living in the losses I had experienced before and living like I could control what happened. I don’t ever want to live that way. I took all the joy out of expecting Elijah and his birth because of my worry about the past. How sad. I am determined to not live that way again. Worrying that something bad that has happened in the past will happen again is no way to live. It takes the joy out of today. I had no control over whether my babies lived or died. No amount of worry could change anything that happened or will happen. It is better to live in the moment and realize that today has enough trouble of its own, worrying about what might come does nothing but rob you of the joy of the moments you are in right now. Another great entry. Thanks for the reminders.